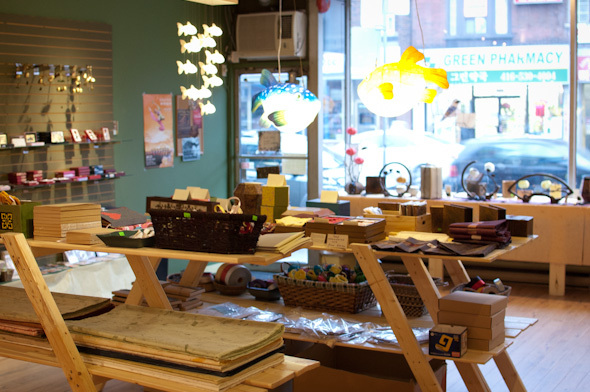 Hanji Handmade Paper and Gifts is a petite little shop straddling Koreatown and the Annex . Inside, there are soft touches of olive green on the walls, juxtaposed by colours, shapes, and textures beaming off handmade Korean products lining the store's perimeter. It's a mom & pop in every sense, owned by husband and wife Hyun Suk and Catherine Choi. I meet Hyun Suk at the door and am quickly introduced to Catherine, who is arranging bits of cards and stationery on the section's lowest shelf. We get to chatting and Hyun Suk ducks out of the store for a few minutes, Catherine telling me with a smile that, "He's still a little shy about English." The two met with Catherine was teaching English in Korea in 2009. They got engaged after Catherine moved back to Canada and made the decision to open their own store not long thereafter (though Catherine still works another job). 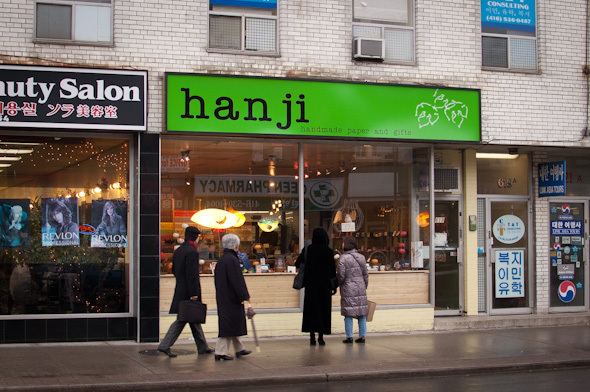 "There was this neighbourhood In Seoul," Catherine says when I ask her about her inspiration for Hanji. "And there you would find just such beautiful things. 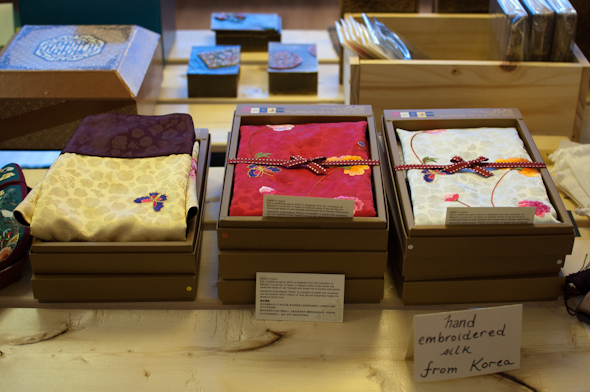 Beautiful handmade pieces by local artists." "Well," she continues, "when I came back here I couldn't find anything like it. So I thought we could bring some of it here." 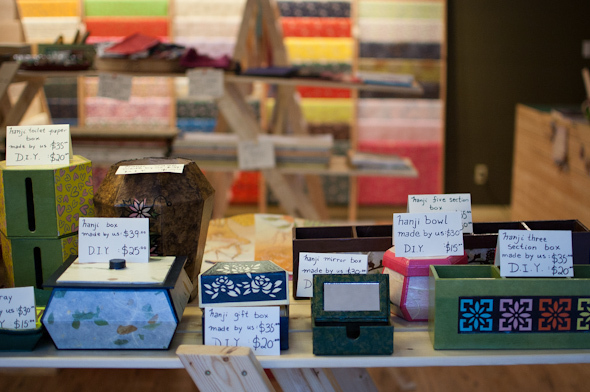 Hyun Suk, an artist himself, did a lot of the personal connecting with Korean artists and has sourced a collection of handmade paper lamps, cards, books, and more for the shop named for the Korean word for handmade mulberry paper. Hyuan Suk returns to the store and the pair show me around the space, pointing out their favourite products. "These lamps are really cool," Catherine says, walking towards the lineup on the store's west wall. "They're all made from one artist, and all made out of paper--even the bases." Indeed, a light touch reveals that they are, in fact, paper, though I don't think a gust of wind will necessarily blow them over. "They're actually quite sturdy," Catherine says of the lamps, which range in price from $59.95 to $299.95. "And the switches are right here," she says, tapping a little metal ball on the lamps' bases. "They go on and off with a tap." Like the first time I saw an automatic soap dispenser, I'm mesmerized. Simple pleasures. We next move onto the assortment of paper, which starts at $3.50 (basic tissue) per sheet. Catherine and Hyuan Suk point out their favourites, which include printed leaf ($9.00) and handmade mulberry swirl ($13.00) designs. 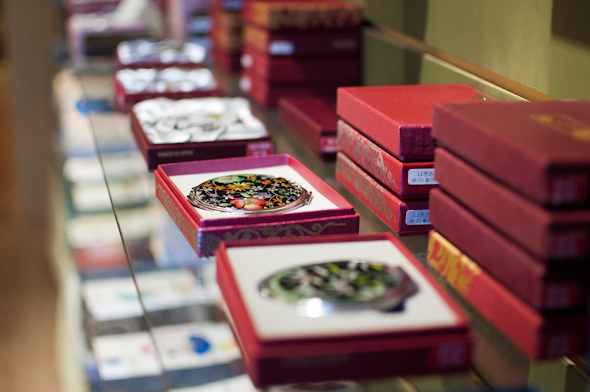 Not everything at Hanji is made of paper, though the handmade ceramic mugs, candle holders, and mother-of-pearl mirrors are still made in Korea. 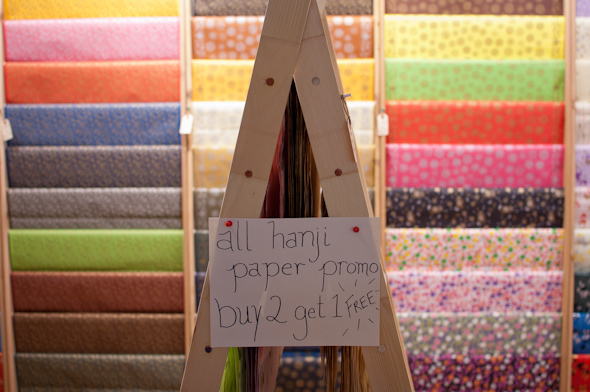 Hanji itself has a strong DIY vibe, with lots of ribbons, ties, and papers for various projects. Its book-making materials, which include everything from printed covers to pre-bound pages, metal corners and necessary pliers, have proven to be a big hit. Catherine says they're thinking of setting up a book-making table and perhaps hosting some workshops in the future. Before leaving the shop Catherine and Hyuan Suk make of note of telling me that all gifts are wrapped free of charge, and needless to say, Hanji has an abundance of options.